'In recent decades, interest in hunger artists has greatly diminished.' 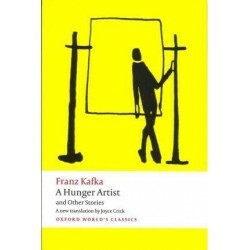 Kafka published two collec..
James Edward Austen-Leigh's Memoir of his aunt Jane Austen was published in 1870, over f.. In A Sicilian Romance (1790) Ann Radcliffe began to forge the unique mixture of the psyc.. The first of the Sherlock Holmes stories, this was also the first of Conan Doyle's books to be pub.. This volume includes "The Battle of the Books" and "The Mechanical Operation of the Spirit", both .. Here is a marvelous collection of plays from the English Renaissance period, offering prime exampl.. In Adam Bede (1859) George Eliot took the well-worn tale of a lovely dairy-maid seduced ..
You don't know about me, without you have read a book by the name of "The Adventures of Tom Sawyer.. The fables of Aesop have become one of the most enduring traditions of European culture, ever sinc.. Drawing directly on her own unhappy experiences, Anne Bronte's first-person narrative describes th.. The "Alice" books are two of the most translated, most quoted, and best-known books in the world. ..
Usually classified as a "problem comedy," All's Well that Ends Well is a psychologically.. This volume of Antigone, Oedipus the King, Electra contains three masterpieces by the Gr.. The stories contained in this "store house of ingenious fiction" initiate a pattern of literary re..
Aurora Leigh, now available in the first critically edited and fully annotated edition for almost ..
Franklin's writings span a long and distinguished career of literary, scientific, and political in..
"Barchester Towers", Trollope's most popular novel, is the second of the six "Chronicles of Barset.. Written at a time of social unrest in Victorian Britain and set in London at the time of the anti-..
First published in 1844, this is Thackeray's earliest substantial work of fiction and perhaps his .. In Basil's secret and unconsummated marriage to Margaret Sherwin, and the consequent horrors of be..
Maupassant's second novel, Bel-Ami (1885) is the story of a ruthlessly ambitious young man (George..
Beowulf is the longest and finest literary work to have come down to us from Anglo-Saxon times, an..
Woolf's last novel and, in her own opinion, more quintessential than any of her others. Set in the..
`What is done out of love always takes place beyond good and evil.' Always provocative, the Fri.. This new verse translation of Aristophanes' comedies offers one of the world's great comic dramati.. Bleak House, Dickens's most daring experiment in the narration of a complex plot, challenges the r.. The exciting sequel to the enormously successful Is Heathcliff A Murderer?, John Sutherland's..
Five of the stories selected here demonstrate Prosper Merimee's ability to explore the contrast be..
With her satire on Anglo-Irish landlords in Castle Rackrent (1800), Maria Edgeworth pion.. This new collection of Austen's brilliant short fiction is the first annotated edition of her shor.. The Authors in Context series, a subseries of the Oxford World's Classics series, examines the wor.. Considered by many to be the most terrifying writer in English, M. R. James was an eminent schol..
Stéphane Mallarmé was the most radically innovative of nineteenth-century poets, and a key figure .. In these letters to his friends and relations, Pliny the Younger, lawyer, author, and natural phil.. This is the only fully annotated and modernized edition to bring together Shakespeare's sonnets as.. In his own day the dominant personality of the Western Church, Augustine of Hippo today stands as .. In his Confessions Jean-Jacques Rousseau tells the story of his life, from the formative experienc.. In this witty and poignant comedy of early-Victorian life in a country town, Elizabeth Gaskell des.. In the Critique of Judgement, Kant offers a penetrating analysis of our experience of the bea..
'Tonight When I make my sweeping bow at heaven's gate, One thing I shall still possess, at any rat.. The tale of Daisy's irruption into staid European society enjoyed, as did Daisy herself, a su..
Daniel Deronda, the last of Eliot's novels, is the most complete expression of her idealism. Its m..
Longus's romance tells the story of two teenagers, Daphnis and Chloe, who love each other but do n..
Gogol's tale of a dismissed civil servant turned unscrupulous confidence man is the most essential.. The third of Dostoevsky's five major novels, Devils (1871-2), also known as The Possessed, is at o..
Alain de Botton's bestselling The Consolations of Philosophy--later made into a six-part TV s..